Wayne Rooney still has a future as a Manchester United striker, according to manager Louis van Gaal. Captain Rooney, 29, has not scored in eight games in all competitions since being played in midfield. The England international is set to stay in that role for Wednesday's Premier League match against Burnley at Old Trafford. "It can change every week," said Dutchman Van Gaal. "It is dependable on the circumstances." Rooney said in 2013 that he considered his future at United after being played in midfield by then manager Sir Alex Ferguson. He began this season up front and has scored eight goals in 22 games to move third in United's list of all-time scorers. 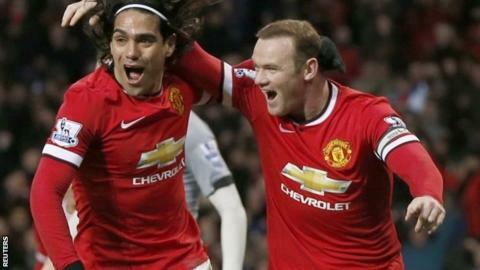 Van Gaal said Rooney has been used in a deeper position to help accommodate fellow strikers Robin van Persie and Radamel Falcao. "When I am not lining up Falcao, you are asking 'where is Falcao? '," said the Dutchman. "When I don't line up Van Persie you are asking 'where is van Persie?'. "When I play Rooney in midfield I know in advance he is not always in the situation to score." United are fourth in the table, one point behind third-placed Southampton.